This article is about the construction toy. For the company, see The Lego Group. For other uses, see Lego (disambiguation). Lego (/ˈlɛɡoʊ/; Danish: [ˈleːɡo]; stylised as LEGO) is a line of plastic construction toys that are manufactured by The Lego Group, a privately held company based in Billund, Denmark. The company's flagship product, Lego, consists of colourful interlocking plastic bricks accompanying an array of gears, figurines called minifigures, and various other parts. Lego pieces can be assembled and connected in many ways to construct objects, including vehicles, buildings, and working robots. Anything constructed can be taken apart again, and the pieces reused to make new things. The Lego Group began manufacturing the interlocking toy bricks in 1949. Movies, games, competitions, and six Legoland amusement parks have been developed under the brand. As of July 2015, 600 billion Lego parts had been produced. The Lego Group began in the workshop of Ole Kirk Christiansen (1891–1958), a carpenter from Billund, Denmark, who began making wooden toys in 1932. In 1934, his company came to be called "Lego", derived from the Danish phrase leg godt [lɑjˀ ɡ̊ʌd̥], which means "play well". In 1947, Lego expanded to begin producing plastic toys. In 1949 Lego began producing, among other new products, an early version of the now familiar interlocking bricks, calling them "Automatic Binding Bricks". These bricks were based on the Kiddicraft Self-Locking Bricks, which had been patented in the United Kingdom in 1939 and released in 1947. Lego had received a sample of the Kiddicraft bricks from the supplier of an injection-molding machine that it purchased. The bricks, originally manufactured from cellulose acetate, were a development of the traditional stackable wooden blocks of the time. The Lego Group's motto is det bedste er ikke for godt which means roughly "only the best is the best" (more literally "the best is never too good"). This motto, which is still used today, was created by Christiansen to encourage his employees never to skimp on quality, a value he believed in strongly. By 1951 plastic toys accounted for half of the Lego company's output, even though the Danish trade magazine Legetøjs-Tidende ("Toy-Times"), visiting the Lego factory in Billund in the early 1950s, felt that plastic would never be able to replace traditional wooden toys. Although a common sentiment, Lego toys seem to have become a significant exception to the dislike of plastic in children's toys, due in part to the high standards set by Ole Kirk. By 1954, Christiansen's son, Godtfred, had become the junior managing director of the Lego Group. It was his conversation with an overseas buyer that led to the idea of a toy system. Godtfred saw the immense potential in Lego bricks to become a system for creative play, but the bricks still had some problems from a technical standpoint: their locking ability was limited and they were not versatile. In 1958, the modern brick design was developed; it took five years to find the right material for it, ABS (acrylonitrile butadiene styrene) polymer. The modern Lego brick design was patented on 28 January 1958. The Lego Group's Duplo product line was introduced in 1969 and is a range of simple blocks whose lengths measure twice the width, height, and depth of standard Lego blocks and are aimed towards younger children. In 1978, Lego produced the first minifigures, which have since become a staple in most sets. In May 2011, Space Shuttle Endeavour mission STS-134 brought 13 Lego kits to the International Space Station, where astronauts built models to see how they would react in microgravity, as a part of the Lego Bricks in Space program. In May 2013, the largest model ever created was displayed in New York City and was made of over 5 million bricks; a 1:1 scale model of an X-wing fighter. Other records include a 112-foot (34 m) tower and a 4 km (2.5 mi) railway. Lego's popularity is demonstrated by its wide representation and usage in many forms of cultural works, including books, films and art work. It has even been used in the classroom as a teaching tool. In the US, Lego Education North America is a joint venture between Pitsco, Inc. and the educational division of the Lego Group. In 1998, Lego bricks were one of the original inductees into the National Toy Hall of Fame at The Strong in Rochester, New York. Lego pieces of all varieties constitute a universal system. Despite variation in the design and the purposes of individual pieces over the years, each piece remains compatible in some way with existing pieces. 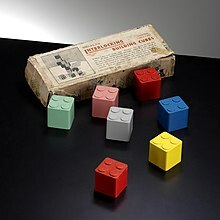 Lego bricks from 1958 still interlock with those made in the current time, and Lego sets for young children are compatible with those made for teenagers. Six bricks of 2 × 4 studs can be combined in 915,103,765 ways. Each Lego piece must be manufactured to an exacting degree of precision. When two pieces are engaged they must fit firmly, yet be easily disassembled. The machines that manufacture Lego bricks have tolerances as small as 10 micrometres. Lego Digital Designer is an official piece of Lego software for Mac OS X and Windows which allows users to create their own digital Lego designs. The program once allowed customers to order their custom designs with a service to ship physical models from Digital Designer to consumers; the service ended in 2012. Since 1963, Lego pieces have been manufactured from a strong, resilient plastic known as acrylonitrile butadiene styrene (ABS). As of September 2008, Lego engineers use the NX CAD/CAM/CAE PLM software suite to model the elements. The software allows the parts to be optimised by way of mould flow and stress analysis. Prototype moulds are sometimes built before the design is committed to mass production. The ABS plastic is heated to 232 °C (450 °F) until it reaches a dough-like consistency. It is then injected into the moulds at pressures between 25 and 150 tonnes, and takes approximately 15 seconds to cool. The moulds are permitted a tolerance of up to twenty micrometres, to ensure the bricks remain connected. Human inspectors check the output of the moulds, to eliminate significant variations in colour or thickness. According to the Lego Group, about eighteen bricks out of every million fail to meet the standard required. Lego factories recycle all but about 1 percent of their plastic waste from the manufacturing process. If the plastic cannot be re-used in Lego bricks, it is processed and sold on to industries that can make use of it. Lego has a self-imposed 2030 deadline to find a more eco-friendly alternative to the ABS plastic it currently uses in its bricks. 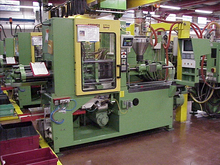 Manufacturing of Lego bricks occurs at several locations around the world. Moulding is done in Billund, Denmark; Nyíregyháza, Hungary; Monterrey, Mexico and most recently in Jiaxing, China. Brick decorations and packaging are done at plants in Denmark, Hungary, Mexico and Kladno in the Czech Republic. The Lego Group estimates that in five decades it has produced 400 billion Lego blocks. Annual production of Lego bricks averages approximately 36 billion, or about 1140 elements per second. According to an article in BusinessWeek in 2006, Lego could be considered the world's No. 1 tire manufacturer; the factory produces about 306 million small rubber tires a year. The claim was reiterated in 2012. In December 2012, the BBC's More or Less radio program asked the Open University's engineering department to determine "how many Lego bricks, stacked one on top of the other, it would take for the weight to destroy the bottom brick?" Using a hydraulic testing machine, the engineering department determined the average maximum force a 2×2 Lego brick can stand is 4,240 newtons; since an average 2×2 Lego brick has a mass of 1.152 grams (0.0406 oz), according to their calculations it would take a stack of 375,000 bricks to cause the bottom brick to collapse, which represents a stack 3,591 metres (11,781 ft) in height. Private tests have shown several thousand assembly-disassembly cycles before the bricks begin to wear out, although Lego tests show fewer cycles. In 2018, Lego announced that it will be using bio-derived polyethylene to make its botanical elements (parts such as leaves, bushes and trees). Since the 1950s, the Lego Group has released thousands of sets with a variety of themes, including space, robots, pirates, trains, Vikings, castle, dinosaurs, undersea exploration, and wild west. Some of the classic themes that continue to the present day include Lego City (a line of sets depicting city life introduced in 1973) and Lego Technic (a line aimed at emulating complex machinery, introduced in 1977). Over the years, Lego has licensed themes from numerous cartoon and film franchises and even some from video games. These include Batman, Indiana Jones, Pirates of the Caribbean, Harry Potter, Star Wars, and Minecraft. Although some of the licensed themes, Lego Star Wars and Lego Indiana Jones, had highly successful sales, Lego has expressed a desire to rely more upon their own characters and classic themes, and less upon licensed themes related to movie releases. For the 2012 Summer Olympics in London Lego released a special Lego Minifigures serie and for the 2016 Summer Olympics and 2016 Summer Paralympics in Rio, Lego released a kit with the Olympic and Paralympic mascots Vinicius and Tom. One of the largest Lego sets commercially produced was a minifig-scaled edition of the Star Wars Millennium Falcon. Designed by Jens Kronvold Fredericksen, it was released in 2007 and contained 5,195 pieces. It was surpassed by a 5,922-piece Taj Mahal. A redesigned Millenium Falcon recently retook the top spot in 2017 with 7,541 pieces. Lego also initiated a robotics line of toys called 'Mindstorms' in 1999, and has continued to expand and update this range ever since. The roots of the product originate from a programmable brick developed at the MIT Media Lab, and the name is taken from a paper by Seymour Papert, a computer scientist and educator who developed the educational theory of constructionism, and whose research was at times funded by the Lego Group. The programmable Lego brick which is at the heart of these robotics sets has undergone several updates and redesigns, with the latest being called the 'EV3' brick, being sold under the name of Lego Mindstorms EV3. The set includes sensors that detect touch, light, sound and ultrasonic waves, with several others being sold separately, including an RFID reader. The intelligent brick can be programmed using official software available for Windows and Mac computers, and is downloaded onto the brick via Bluetooth or a USB cable. There are also several unofficial programs and compatible programming languages that have been made to work with the brick, and many books have been written to support this community. There are several robotics competitions which use the Lego robotics sets. The earliest is Botball, a national U.S. middle- and high-school competition stemming from the MIT 6.270 Lego robotics tournament. Other Lego robotics competitions include Junior FIRST LEGO League (Jr.FLL) for students ages 6–9 and FIRST Lego League (FLL) for students ages 9–16 (age 9–14 in the United States, Canada, and Mexico). Jr.FLL and FLL offer real-world engineering challenges to participants. FLL uses Lego-based robots to complete tasks. Jr.FLL participants build models out of Lego elements. In its 2010 season, there were 16,070 FLL teams in over 55 countries. In its 2010 season, there were 2,147 Jr.FLL teams with 12,882 total student participants in the United States and Canada. The international RoboCup Junior football competition involves extensive use of Lego Mindstorms equipment which is often pushed to its extreme limits. The capabilities of the Mindstorms range have now been harnessed for use in Iko Creative Prosthetic System, a prosthetic limbs system designed for children. Designs for these Lego prosthetics allow everything from mechanical diggers to laser-firing spaceships to be screwed on to the end of a child's limb. Iko is the work of the Chicago-based Colombian designer Carlos Arturo Torres, and is a modular system that allows children to customise their own prosthetics with the ease of clicking together plastic bricks. Designed with Lego's Future Lab, the Danish toy company's experimental research department, and Cirec, a Colombian foundation for physical rehabilitation, the modular prosthetic incorporates myoelectric sensors that register the activity of the muscle in the stump and send a signal to control movement in the attachment. A processing unit in the body of the prosthetic contains an engine compatible with Lego Mindstorms, the company's robotics line, which lets the wearer build an extensive range of customised, programmable limbs. The definitive shape of the Lego bricks, with the inner tubes, was patented by the Lego Group in 1958. 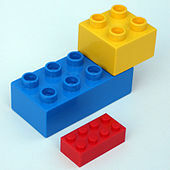 Several competitors have attempted to take advantage of Lego's popularity by producing blocks of similar dimensions, and advertising them as being compatible with Lego bricks. In 2002, Lego sued the CoCo Toy Company in Beijing for copyright infringement over its "Coko bricks" product. CoCo was ordered to cease manufacture of the products, publish a formal apology and pay damages. Lego sued the English company Best-Lock Construction Toys in German courts in 2004 and 2009; the Federal Patent Court of Germany denied Lego trademark protection for the shape of its bricks for the latter case. In 2005, the Lego Company sued Canadian company Mega Bloks for trademark violation, but the Supreme Court of Canada upheld Mega Bloks' rights to sell their product. In 2010, the European Court of Justice ruled that the eight-peg design of the original Lego brick "merely performs a technical function [and] cannot be registered as a trademark." First launched in 1996, the Lego website has developed over the years, and provides many extra services beyond an online store and a product catalogue. There are also moderated message boards that were founded in 2001. The site also includes instruction booklets for all Lego sets dating back to 2002. My Lego Network is a social networking site that involves items, blueprints, ranks, badges which are earned for completing certain tasks, trading and trophies called masterpieces which allow users to progress to go to the next rank. The website has a built in inbox which allows users to send pre written messages to one another. 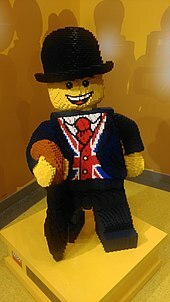 The Lego Network includes automated non-player characters within called "Networkers", who are able to do things which normal users cannot do, sending custom messages, and selling masterpieces and blueprints. The site also has modules which are set up on the user's page that give the user items, or that display picture compositions. Before My Lego Network, there were Lego Club Pages, which essentially held the same purpose, although the design lacked complex interaction. Merlin Entertainments operates seven Legoland amusement parks, the original in Billund, Denmark, the second in Windsor, England, the third in Günzburg, Germany, the fourth in Carlsbad, California, the fifth in Winter Haven, Florida, the sixth in Nusajaya, Malaysia, the seventh in Dubai, United Arab Emirates, and the eighth in Shanghai, China. On 13 July 2005, the control of 70% of the Legoland parks was sold for $460 million to the Blackstone Group of New York while the remaining 30% is still held by Lego Group. There are also eight Legoland Discovery Centres, two in Germany, four in the United States, one in Japan and one in the United Kingdom. Two Legoland Discovery Centres opened in 2013: one at the Westchester Ridge Hill shopping complex in Yonkers, New York, and one at the Vaughan Mills in Vaughan, Ontario, Canada. Another has opened at the Meadowlands complex in East Rutherford, New Jersey, in 2014. Lego operates 132 so-called "Lego Store" retail shops. There are stores at the Downtown Disney shopping complexes at Disneyland and Walt Disney World Resorts as well as in Mall of America in Bloomington, Minnesota. The opening of each store is celebrated with weekend-long event in which a Master Model Builder creates, with the help of volunteers—most of whom are children—a larger-than-life Lego statue, which is then displayed at the new store for several weeks. Since around 2000, the Lego Group has been promoting "Lego Serious Play", a form of business consultancy fostering creative thinking, in which team members build metaphors of their organizational identities and experiences using Lego bricks. Participants work through imaginary scenarios using visual three-dimensional Lego constructions, imaginatively exploring possibilities in a serious form of play. Lego branched out into the video game market in 1997 by founding Lego Media International Limited, and Lego Island was released that year by Mindscape. After this Lego released titles such as Lego Creator and Lego Racers. After Lego closed down their publishing subsidiary, they moved on to a partnership with Traveller's Tales, and went on to make games like Lego Star Wars, Lego Indiana Jones, Lego Batman, and many more including the very well-received Lego Marvel Super Heroes game, featuring New York City as the overworld and including Marvel characters from the Avengers, the Fantastic Four, the X-Men, and more. More recently, Lego has created a game based on The Lego Movie, due to its popularity. Lego Games launched in 2009, was a series of Lego-themed board games designed by Cephas Howard and Reiner Knizia in which the players usually build the playing board out of Lego bricks and then play with Lego-style players. Examples of the games include "Minotaurus", in which players roll dice to move characters within a brick-build labyrinth, "Creationary", in which players must build something which appears on a card, or "Ramses Pyramid", in which players collect gems and climb up a customisable pyramid. Like many board games, the games use dice. In Lego Games, the dice are Lego, with Lego squares with symbols on Lego studs on the dice, surrounded by rubber. The games vary from simple to complex, some are similar to "traditional" board games, while others are completely different. Several straight-to-DVD computer animated Bionicle and Hero Factory movies were produced, and Lego: The Adventures of Clutch Powers was released on DVD in February 2010, a computer-animated film made by Tinseltown Toons. The Lego Movie, a feature film based on Lego toys, was released by Warner Bros. in February 2014. It featured Chris Pratt in the lead role, with substantial supporting characters voiced by Elizabeth Banks, Will Arnett, Morgan Freeman, Liam Neeson, Alison Brie, Will Ferrell and Nick Offerman. A contest was held for contestants to submit designs for vehicles to be used in the film. After the release of The Lego Movie, independent Canadian toy retailers reported issues with shortages of Lego products and cited cancellations of Lego pre-orders without warning as a motive to stock compatible, rival products. A spin-off of The Lego Movie, entitled The Lego Batman Movie, directed by Chris McKay was released in the US in February 2017. In June 2013, it was reported that Warner Bros. was developing a feature film adaptation of Lego Ninjago. Brothers Dan Hageman and Kevin Hageman were attached to write the adaptation, while Dan Lin and Roy Lee, along with Phil Lord and Chris Miller, were announced as producers. The film, The Lego Ninjago Movie, was released in September 2017. A computer-generated animated series based on Lego Ninjago: Masters of Spinjitzu began in 2011, and another based on Legends of Chima began in 2013. A television series of Lego City has also been announced. Lego has an ongoing deal with publisher Dorling Kindersley (DK), who are producing a series of illustrated hardback books looking at different aspects of the construction toy. The first was "The Ultimate Lego Book", published in 1999. More recently, in 2009, the same publisher produced The LEGO Book, which was sold within a slipcase along with Standing Small: A celebration of 30 years of the LEGO minifigure, a smaller book focused on the minifigure. In 2012, a revised edition was published. Also in 2009, DK also published books on Lego Star Wars and a range of Lego-based sticker books. Although no longer being published in the United States by Scholastic, books covering events in the Bionicle storyline are written by Greg Farshtey. They are still being published in Europe by AMEET. Bionicle comics, also written by Farshtey, are compiled into graphic novels and were released by Papercutz. This series ended in 2009, after nine years. There is also the Lego Club and Brickmaster magazine, the latter discontinued in 2011. Since 1993, LEGOwear Clothes have been produced and marketed by a Danish company called Kabooki under licence from Lego Group. The clothes are for boys and girls from 0 to 12 years old and the partnership also ties in with other Lego products such as 'Ninjago', 'Hero Factory' and the new 'Friends' theme for girls. ^ "Lego pronunciation: How to pronounce Lego in Danish". Forvo. ^ a b "Lego History-About Us". Lego. Archived from the original on 5 September 2015. Retrieved 6 September 2015. ^ "How a Lego Works". How Stuff Works. Retrieved 6 September 2015. ^ "Lego Fun Facts". Brick Recycler. Archived from the original on 26 November 2015. Retrieved 6 September 2015. ^ a b "Lego Overtakes Ferrari as the World's Most Powerful Brand". Brand Finance. 17 February 2015. Retrieved 20 February 2015. ^ "Improvements in toy building blocks, patent GB529580 of 25 November 1940 by Harry Fisher Page of Kiddicraft". espacenet.com. 17 July 2010. Retrieved 17 July 2010. ^ Lauwaert, M. (2008). "Playing outside the box – on LEGO toys and the changing world of construction play". History & Technology, 24(3), 221–237. ^ a b "Lego Celebrates 50 Years of Building". TIME. 28 January 2008. Archived from the original on 31 January 2008. Retrieved 28 January 2008. ^ "About Duplo". Lego. Archived from the original on 6 September 2015. Retrieved 6 September 2015. ^ "The history of the Lego minifigure". Toys to Remember. Archived from the original on 6 September 2015. Retrieved 6 September 2015. ^ Banks, Dave (28 April 2011). "Space Shuttle Endeavour Launches Tomorrow With a Special Payload". Wired News. Archived from the original on 26 July 2014. Retrieved 2 May 2011. ^ Eaton, Kit (29 April 2011). "Space Shuttle Endeavour: Made Of Spare Parts". Fast Company. Archived from the original on 3 May 2011. Retrieved 2 May 2011. ^ Diaz, Jesus (23 May 2013). "This Incredible Full Scale Lego X-Wing Is the Largest Model in History". Gizmodo. Archived from the original on 3 June 2013. Retrieved 24 May 2013. ^ Lee, Kevin. "Delaware High School Students Complete World's Tallest LEGO Tower Archived 22 August 2013 at the Wayback Machine" Inhabitat, 24 August 2013. Accessed: 29 March 2014. ^ Lofgren, Kristine. "The World's Longest LEGO Railway Stretches Nearly 2.5 Miles Long Archived 30 March 2014 at the Wayback Machine" Inhabitat, 19 May 2013. Accessed: 29 March 2014. ^ "Longest Lego Railway Archived 10 August 2013 at the Wayback Machine", 16 July 2013. Accessed: 29 March 2014. ^ Chan, Derek. "Lego Educational Resource". Blogger. Archived from the original on 25 April 2012. Retrieved 3 September 2011. ^ "Lego Education (see footnote)". Archived from the original on 14 February 2014. Retrieved 6 September 2015. ^ "Lego". National Toy Hall of Fame. Archived from the original on 25 September 2015. ^ "Learn to speak LEGO! – BASIC TERMS". Retrieved 10 June 2018. , The Brick Blogger. ^ Roshanzamir, Ali (10 December 2013). "Matematik-professoren leger med lego-klodser". University of Copenhagen Faculty of Science. Archived from the original on 2 April 2015. Retrieved 29 March 2014. ^ a b "Company Profile, page 20" (PDF). The Lego Group. 2010. Archived from the original (PDF) on 11 May 2013. ^ "Lego Specifications". Orionrobots.co.uk. 26 February 2011. Archived from the original on 23 August 2011. Retrieved 3 October 2011. ^ Dimensions Guide (13 December 2010). "Dimensions of a Standard Lego Brick". Dimensionsguide.com. Archived from the original on 5 September 2011. Retrieved 3 October 2011. ^ a b Frances Corbet (September 2008). "Child's Play". Develop 3D. X3DMedia: 25–27. ^ "LEGO Digital Designer". LEGO. n.d. Archived from the original on 3 April 2013. Retrieved 29 March 2014. ^ "Build with Chrome". Google. n.d. Archived from the original on 29 March 2014. Retrieved 29 March 2014. ^ "What happened to DESIGN byME?". LEGO. n.d. Archived from the original on 24 January 2012. Retrieved 29 March 2014. ^ "Company Profile An Introduction to the LEGO Group 2010" (PDF). The Lego Group. 2011. p. 8. Archived from the original (PDF) on 11 May 2013. Retrieved 21 May 2011. ^ "Everything You Always Wanted to Know About Lego". Gizmodo.com. 26 June 2008. Archived from the original on 19 April 2010. Retrieved 29 May 2010. ^ "How Lego Bricks Work". HowStuffWorks.com. Archived from the original on 15 May 2007. Retrieved 13 May 2007. ^ Reed, Stanley (31 August 2018). "Lego Wants to Completely Remake Its Toy Bricks (Without Anyone Noticing)". The New York Times. Retrieved 31 August 2018. 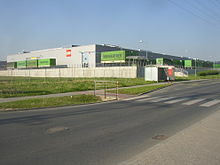 ^ Cendrowicz, Leo (28 January 2008). "Lego Celebrates 50 Years of Building". TIME. Archived from the original on 10 September 2010. Retrieved 26 September 2010. ^ "The Making of ... a LEGO". Bloomberg BusinessWeek. 29 November 2006. Archived from the original on 9 August 2010. Retrieved 28 July 2010. ^ "World Record". Lego. Archived from the original on 4 November 2014. Retrieved 6 September 2015. ^ a b Alexander, Ruth (3 December 2012). "How tall can a Lego tower get?". BBC News. Archived from the original on 4 December 2012. Retrieved 4 December 2012. The average maximum force the bricks can stand is 4,240N. That's equivalent to a mass of 432 kg (950lbs). If you divide that by the mass of a single brick, which is 1.152g, then you get the grand total of bricks a single piece of Lego could support: 375,000. So, 375,000 bricks towering 3.5 kilometers (2.17 miles) high is what it would take to break a Lego brick. ^ Mattise, Nathan (24 March 2014). "Lego bricks still last 30,000+ impressions during new and improved test". Ars Technica. Archived from the original on 28 March 2014. Retrieved 29 March 2014. ^ Godske, Bjørn (29 March 2014). "Robot-test beviser det: Lego kan samles og adskilles over 30.000 gange". Ingeniøren. Archived from the original on 29 March 2014. Retrieved 29 March 2014. ^ Wiencek 1987, p. 54. ^ "Lego Mindstorms and Harry Potter Will Continue". Lego. Archived from the original on 14 September 2015. Retrieved 25 August 2015. ^ "Mascots Tom and Vinicius debut Lego look for Rio 2016". Rio 2016. Archived from the original on 23 May 2016. ^ Meno, George (7 June 2008). "Designing General Grievous". brickjournal.com. Archived from the original on 28 August 2008. Retrieved 6 September 2008. ^ "Mindstorms History". Lego. Archived from the original on 31 August 2015. Retrieved 6 September 2015. ^ a b "About EV3". Lego. Archived from the original on 5 September 2015. Retrieved 6 September 2015. ^ "USFIRST.org". USFIRST.org. Archived from the original on 3 October 2011. Retrieved 3 October 2011. ^ Wainwright, Oliver (22 July 2015). "The Lego prosthetic arm that children can create and hack themselves". The Guardian. Archived from the original on 23 July 2015. Retrieved 23 July 2015. ^ "IKO Creative Prosthetic System". Core77. Archived from the original on 23 July 2015. Retrieved 23 July 2015. ^ Austen, Ian (28 January 2005). "Building a Legal Case, Block by Block". The New York Times. Archived from the original on 2 April 2015. Retrieved 9 March 2015. ^ "News". Ccpit-patent.com.cn. Archived from the original on 7 July 2012. Retrieved 20 August 2013. ^ "Best Lock Petitions US Patent Office". Mass Live. Archived from the original on 19 September 2015. Retrieved 7 September 2015. ^ "Lego Deleted as a Trademark". Marken Magazine. Archived from the original on 1 October 2015. Retrieved 25 August 2015. ^ "Court Ruling". Bundesgerichtshof. Retrieved 6 September 2015. ^ "Lego v. Mega Bloks". Canlii. Archived from the original on 1 February 2016. Retrieved 6 September 2015. ^ "Montreal's Mega Brands face off in court with Lego". Archived from the original on 23 January 2016. Retrieved 6 September 2015. ^ "Lego Website". Lego. Archived from the original on 5 September 2015. Retrieved 6 September 2015. ^ "Lego instruction manuals". Lego. Archived from the original on 14 September 2015. Retrieved 6 September 2015. ^ "My Lego Network". Lego. Archived from the original on 14 September 2015. Retrieved 6 September 2015. ^ "Legoland". Lego. Archived from the original on 5 September 2015. Retrieved 6 September 2015. ^ "Now open: Legoland Dubai". Gulfnews. Archived from the original on 2 November 2016. ^ "Legoland". Lego. Archived from the original on 5 September 2015. Retrieved 6 March 2018. ^ "Legoland sale to Merlin Entertainment". BBC. Archived from the original on 24 May 2006. Retrieved 6 September 2015. ^ "Legoland Discovery Centre". Legolanddiscoverycenter.com. Archived from the original on 27 May 2010. Retrieved 29 May 2010. ^ "LEGO.com: LEGO Stores Home – All Stores". Stores.lego.com. Archived from the original on 7 August 2017. Retrieved 1 January 2015. ^ "Lego Store Grand Openings". Access Winnipeg. Archived from the original on 24 July 2015. Retrieved 25 August 2015. ^ "Serious Play". Lego. Archived from the original on 12 September 2015. Retrieved 6 September 2015. ^ "Lego Marvel Superheroes Video Game". Marvel. Archived from the original on 17 September 2014. Retrieved 6 September 2015. ^ "History of Lego Video Games". Movie Pilot. Archived from the original on 26 August 2015. Retrieved 6 September 2015. ^ Minton, Turner (23 January 2015). "Build Your Destiny with The Lego Movie Videogame on iOS". pastemagazine.com. Paste Media Group. Archived from the original on 10 July 2017. Retrieved 1 November 2017. ^ Gilbert, Brett J. (12 July 2009). "LEGO Board Games: Interview with Cephas Howard". BrettSpiel. Archived from the original on 18 August 2009. Retrieved 24 August 2009. ^ "LEGO Games". Archived from the original on 17 August 2010. Retrieved 6 September 2015. ^ "Lego Games". Board Game Geek. Archived from the original on 15 September 2015. Retrieved 6 September 2015. ^ "LEGO.com LEGO Club : News & Extras". Club.lego.com. 23 February 2010. Archived from the original on 4 June 2010. Retrieved 29 May 2010. ^ "Warner Bros. Sets dates for the Lego Movie". The Hollywood Reporter. Archived from the original on 24 September 2015. Retrieved 6 September 2015. ^ Kit, Borys (9 November 2012). "Will Ferrel and Liam Neeson join Lego animated film". The Hollywood Reporter. Archived from the original on 13 May 2013. Retrieved 6 September 2015. ^ "Lego:The Piece of Resistance Offers Up Two Design Competitions for Fans | Collider | Page 207141". Collider. Archived from the original on 27 December 2013. Retrieved 20 August 2013. ^ "Lego shortage leaves independent stores with empty shelves". cbc.ca. CBC News. 15 December 2014. Archived from the original on 31 December 2014. ^ "Canadian company Brictek thrives amid Lego shortage". cbc.ca. Canadian Broadcasting Corporation. 16 December 2014. Archived from the original on 31 December 2014. ^ "The Lego Batman Movie (2017) – IMDb". IMDb. Archived from the original on 2 February 2017. Retrieved 25 January 2017. ^ Siegel, Tatiana (27 June 2013). "Warner Bros. to Bring Lego's 'Ninjago' to Big Screen (Exclusive)". The Hollywood Reporter. Archived from the original on 4 July 2013. Retrieved 10 July 2013. ^ "The Lego Ninjago Movie (2017) – IMDb". IMDb. Archived from the original on 2 February 2017. Retrieved 25 January 2017. ^ "Lego City TV". IMBD. Archived from the original on 16 March 2016. Retrieved 6 September 2015. ^ "DK Lego Books". DK. Archived from the original on 23 August 2015. Retrieved 6 September 2015. ^ "Bionicle Graphic Novels". Papercutz. Archived from the original on 5 September 2015. Retrieved 26 August 2015. ^ "Brickmaster is Ending". Brickset. Archived from the original on 22 August 2015. Retrieved 8 August 2015. ^ "Kabooki". Lego Wear. Archived from the original on 23 August 2015. Retrieved 25 August 2015. Bagnall, Brian (2002). Core LEGO Mindstorms. Prentice-Hall PTR. ISBN 0-13-009364-5. Bagnall, Brian (2007). Maximum LEGO NXT: Building Robots with Java Brains. Variant Press. ISBN 0-9738649-1-5. Bedford, Allan (2005). The Unofficial LEGO Builder's Guide. San Francisco: No Starch Press. ISBN 1-59327-054-2. Clague, Kevin; Agullo, Miguel; Hassing, Lars C. (2003). LEGO Software Power Tools, With LDraw, MLCad, and LPub. ISBN 1-931836-76-0. Courtney, Tim; Herrera, Ahui; Bliss, Steve (2003). Virtual LEGO: The Official LDraw.org Guide to LDraw Tools for Windows. San Francisco: No Starch Press. ISBN 1-886411-94-8. McKee, Jacob H (2003). Getting Started with LEGO Trains. San Francisco: No Starch Press. ISBN 1-59327-006-2. Ferrari, Mario; Ferrari, Giulio; Hempel, Ralph (2001). Building Robots With LEGO Mindstorms: The Ultimate Tool for Mindstorms Maniacs. Syngress Media. ISBN 1-928994-67-9. Pickering, David (1999). The Ultimate LEGO Book. New York: Dorling Kindersley. ISBN 0-7894-4691-X. Lipkowitz, Daniel (2012). The LEGO Book. London: Dorling Kindersley. ISBN 978-1-4093-7660-6. Wiencek, Henry (1987). The World of LEGO Toys. New York: Harry N. Abrams, Inc., Publishers. ISBN 0-8109-2362-9. Pilegaard, Ulrik; Dooley, Mike (2007). Forbidden LEGO. San Francisco: No Starch Press. ISBN 1-59327-137-9. May, James (2009). James May's Toy Stories. London: Conway. ISBN 978-1-84486-107-1. This page was last edited on 21 March 2019, at 14:13 (UTC).